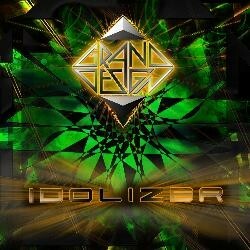 New album by Grand Design. I have to admit that when I reviewed Grand Design’s debut ‘Time Elevation’ I was probably a little unfair to include the definition of the word plagiarism. True, Grand Design’s sound borrows HEAVILY from Def Leppard’s eighties output, but it’s coupled with a hint of the Scandie sound, and adds a quirkiness somewhat akin to the likes of The Poodles and House Of Shakira. In all honesty, it’s not as blatant as Airbourne’s exploitation of AC/DC’s style. Anyway, I listened to ‘Time Elevation’ a lot after reviewing it, and it became one of my favourite albums of that year. Two years on, when that huge drum sound hits you on opener ‘Get On With The Action’, it’s evident that sophomore release ‘Idolizer’ picks up exactly where the debut left off. That wall of multi-layered guitars, and the enormous backing vocals are still there, indicating that Grand Design aren’t planning to change their style anytime soon. The likes of ‘Change Me Up’, ‘Rock Back To The 80s’, ‘OughtoGraugh’ and ‘Let’s Rawk The Nite’ (see what I mean about quirkiness?) are the big sing-along anthems, and ‘Idolize Me’ and ‘You’re Gonna Dig On It’ are more mature sounding, dramatic rockers. There is no real out-and-out ballad, but the mid-tempo ‘Your Love’s A Runaway’ is very reminiscent of the Leps’ ‘Hysteria’, while ‘Addiction For Love’ is a moody and dramatic slow-burner showing a new side to the band, but still has that huge chorus. If I do have one complaint about this album, although the production from main-man Pelle Saether is once again HUGE, occasionally the vocals are a little low down in the mix and get swamped by the multi-tracked guitars, but it really is a minor gripe. If anything the tunes on ‘Idolizer’ aren’t quite as overblown as those on its predecessor, they are a little more concise, maybe a little darker in places, and not quite as instant, but it’s still just as good an album. To once again use Def Leppard as an example, if ‘Time Elevation’ was Grand Design’s ‘Hysteria’, then ‘Idolizer’ is an amalgamation of ‘Pyromania’ and ‘Adrenalize.’ Let’s hope that the musical climate doesn’t change for Grand Design so they have to resort to making a ‘Slang’!